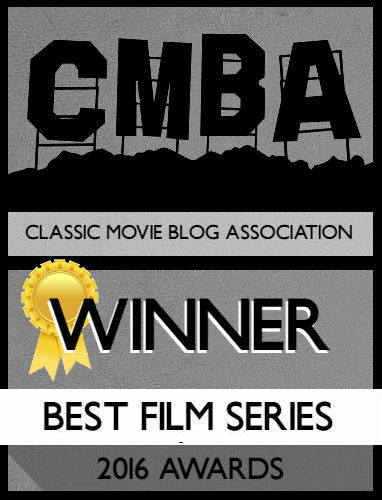 via: http://www.tcm.com/tcmdb/title/83933/Moon-Over-Miami/#tcmarcp-940385-940399 Unless otherwise noted, all images are my own. 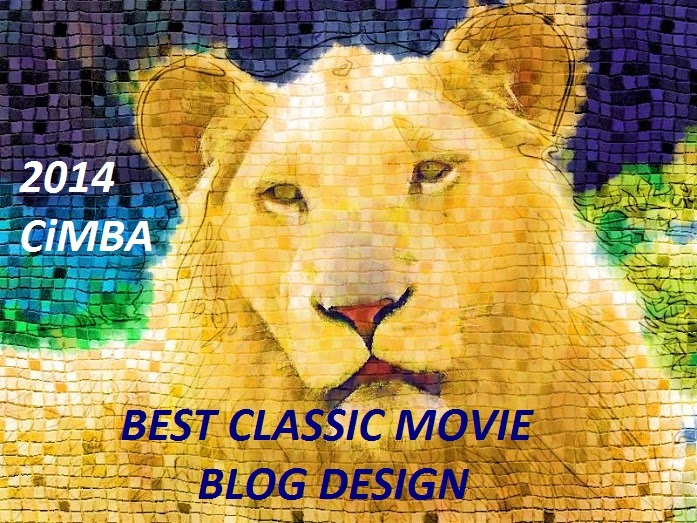 A reader asked if I would write about this movie, and I was only too happy to do so! 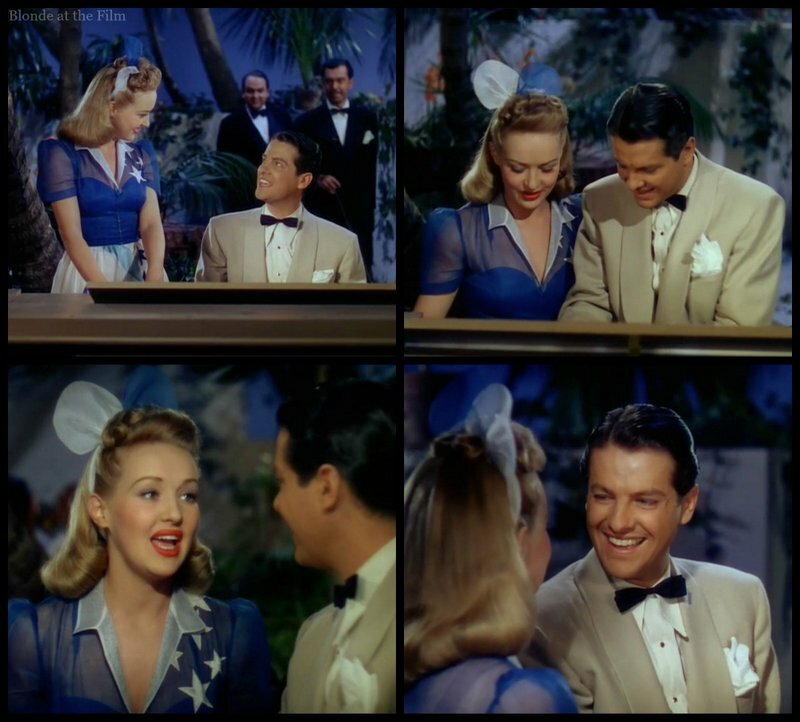 Moon Over Miami is a bright, bubbling, delightful movie that sings summer and giddy romance. 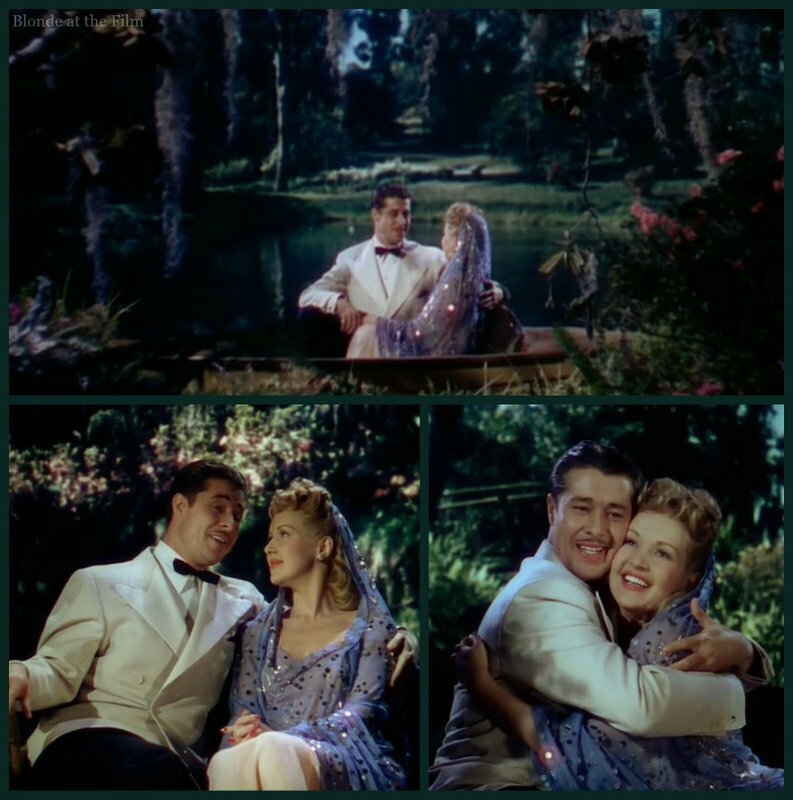 The Technicolor is stunning, Grable and Ameche have crackling chemistry, and it’s a perfect example of the kind of escapist musical fare that was so popular during WWII. To clarify, I don’t mean “escapist” in a derogatory way at all–I love movies like this. 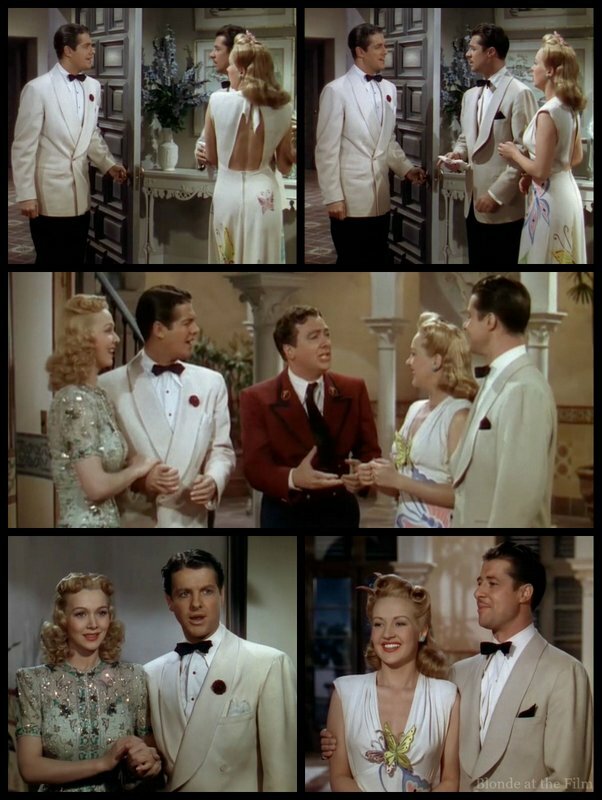 These big, glossy musicals are the studio system doing what it was designed to do, and that is an incredible thing to witness. The film stars Betty Grable, Don Ameche, Robert Cummings, and Carole Landis, and follows the adventures of “TWO SAUCY LITTLE SISTERS ON A MILLIONAIRE MAN-HUNT!” according to a shouted tagline on one of the posters. Moon Over Miami was based on Stephen Powys’ play “Three Blind Mice.” This was the second adaptation of the play: the first, Three Blind Mice (1938), starred Joel McCrea, Loretta Young, and David Niven. 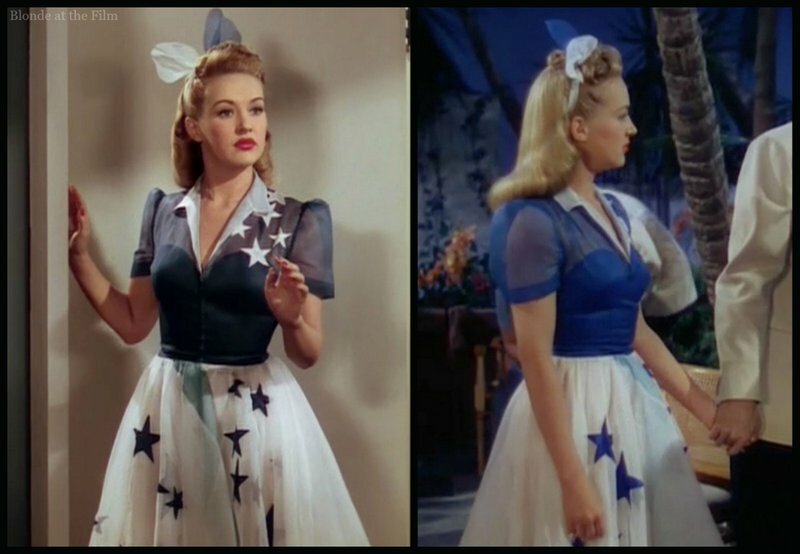 After Moon Over Miami, it was made once more as Three Little Girls in Blue (1946) starring June Haver and George Montgomery. The plot is simple but catchy, and you can see why it was fertile ground for the studios. 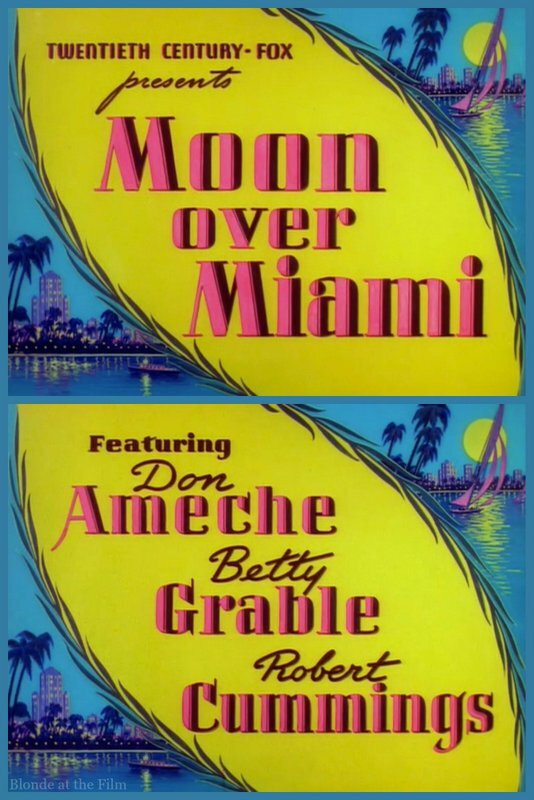 Fun fact: despite the film’s title, the song “Moon Over Miami” never appears. 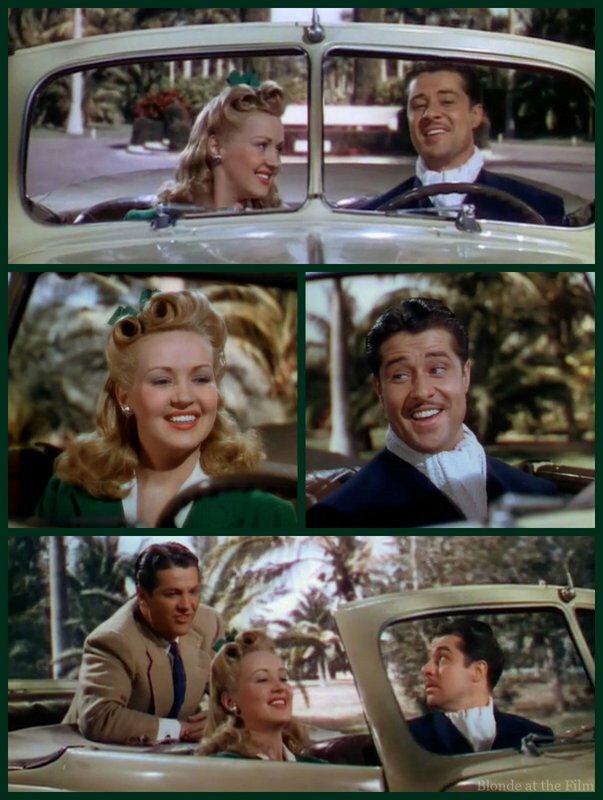 Betty Grable is the star of the picture, though she had only recently become a household name. She had been in Hollywood since 1929, and appeared in small roles and B-movies for about a decade. 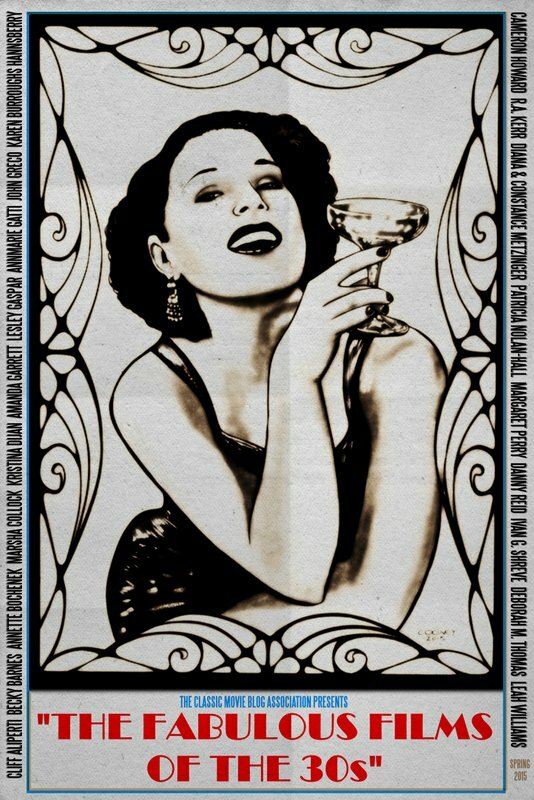 You can see her as a featured performer in The Gay Divorcee (1934), for example. Grable’s big break came when Fox’s blonde star Alice Faye fell ill before starting production on Down Argentine Way (1940). 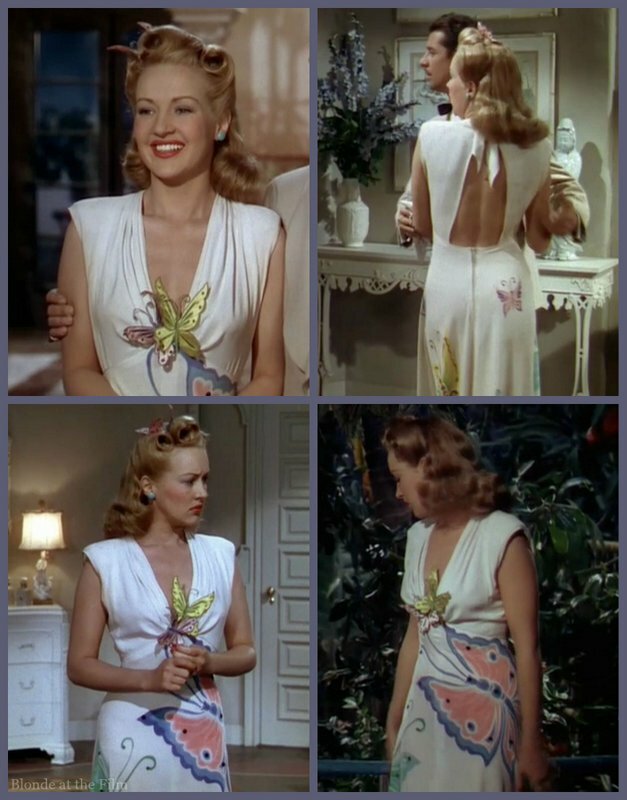 The studio replaced her with Betty Grable, and the film was a huge hit. Fox wasted no time capitalizing on Grable’s newfound stardom and threw her into movie after movie. By 1943, Grable was the top box office star in the world, and in 1947, she was the highest paid entertainer in the country! It must be mentioned that some of her popularity is due to a certain pinup photo. This famous image, taken in 1943, was the most requested pinup among GIs in WWII, and was later named one of the “100 Photographs that Changed the World” by Life magazine. Grable was famous for having the best legs in Hollywood, and you’ll see how the costumes in this movie make sure that her gorgeous gams are on display. Fox even insured her legs with Lloyds of London for one million dollars! But Grable is more than a nice pair of stems. There’s something incredibly effervescent, quick, and cute about her. She’s magnetic on the screen, beautiful, and glamorous, but not terribly mysterious. When you watch one of her movies, it’s easy to see why her beaming pinup and adorable screen personality made her such a popular reminder of home for so many American soldiers. Moon Over Miami starts at Texas Tommy’s, a roadside diner. It promises “service with a song,” and when a car pulls in, carhop Kay Latimer (Betty Grable) dances out with a catchy tune and a smile. 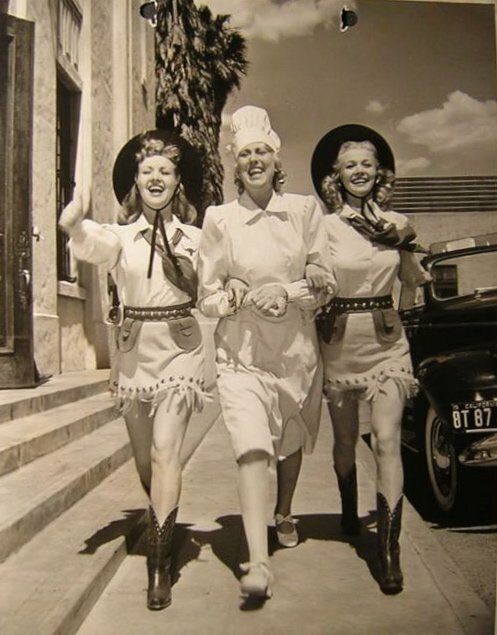 Kay’s sister, Barbara (Carole Landis), is also a waitress at Texas Tommy’s. They’re lovely ladies, but they aren’t treated with much respect by their obnoxious customers. One jerk tells Kay that he’d like a “double order of you on toast.” She retorts, “White or wheat?” and snatches the menu out of his hand. You can listen to the song here. 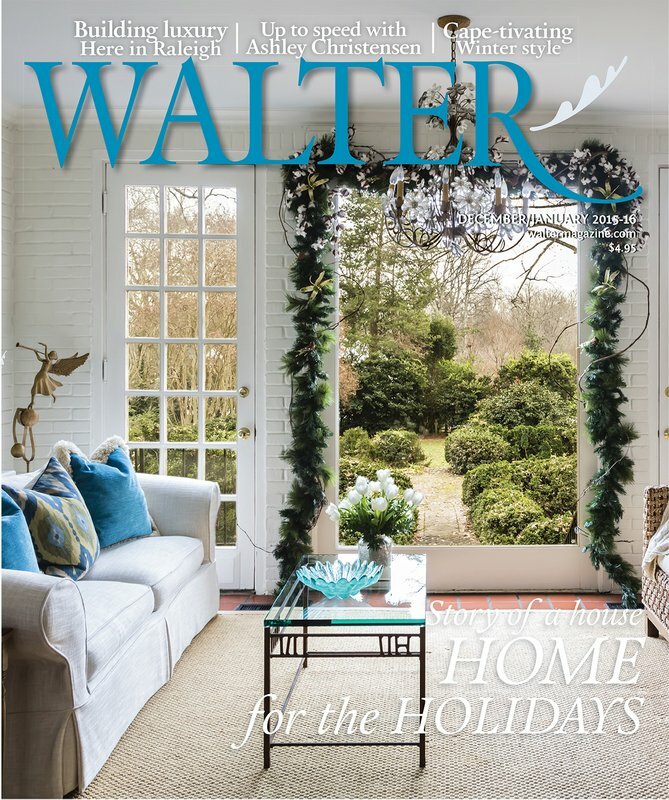 When the mailman arrives, Kay and Barbara run to the kitchen with a long awaited letter. 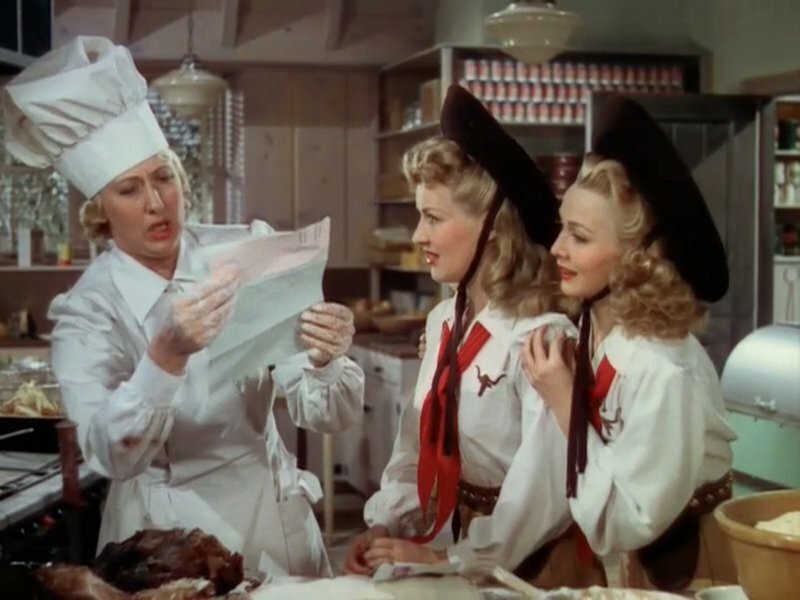 Their Aunt Sue (Charlotte Greenwood, who starred with Grable in Down Argentine Way) reads the letter notifying the three women that they’ve been left $55,000 by a wealthy relative. They rejoice before they realize that their grand inheritance is actually just $4,000 once you remove taxes, legal fees, etc. Hopes dashed. The old “marry for love/marry for money” routine shows up constantly. 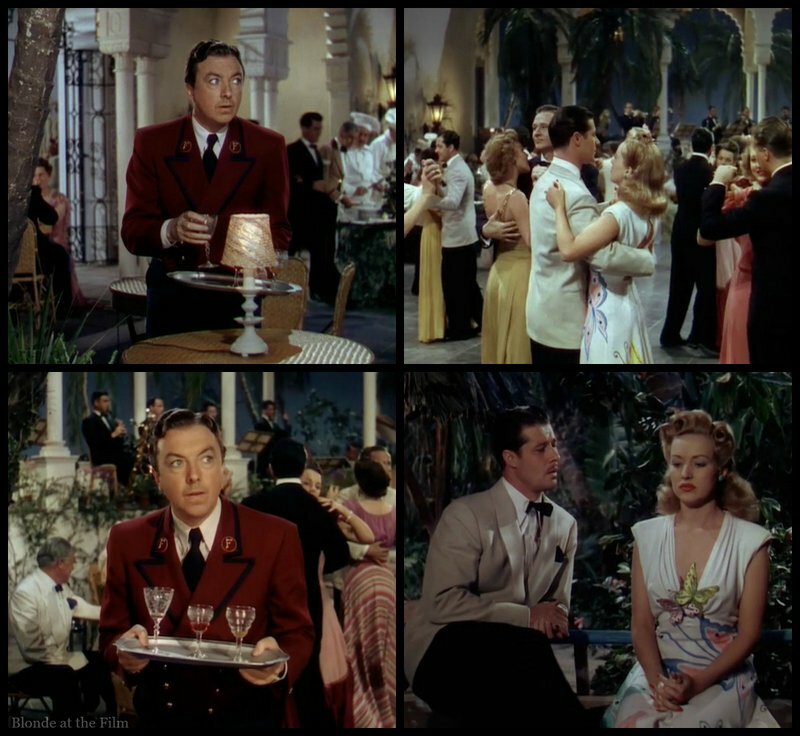 You’ll see it in Midnight, Hands Across The Table, The Palm Beach Story, Some Like it Hot, How to Marry a Millionaire, Gentlemen Prefer Blondes, etc. Typically, the story goes like this: the now-cynical woman watched her parents scrimp and save, and saw the toll it took on their love. She wants something different, and she’s going to get it! But in the end, she marries the man she loves regardless of his bank account. Retroactive spoiler alert for an entire chunk of screwball comedies and musicals of Old Hollywood. Here are our three leading ladies in their Texas Tommy gear on the backlot. 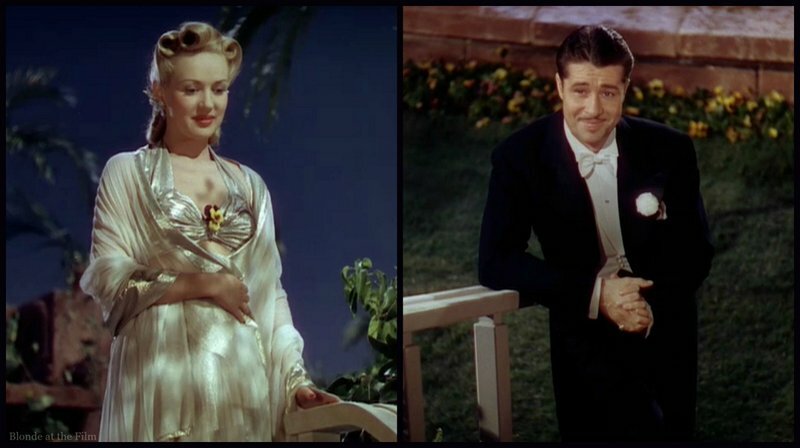 Fun fact: Fox considered casting Virginia Gilmore and Gene Tierney with Betty Grable in this film, and John Payne and Dana Andrews were discussed for the male leads. 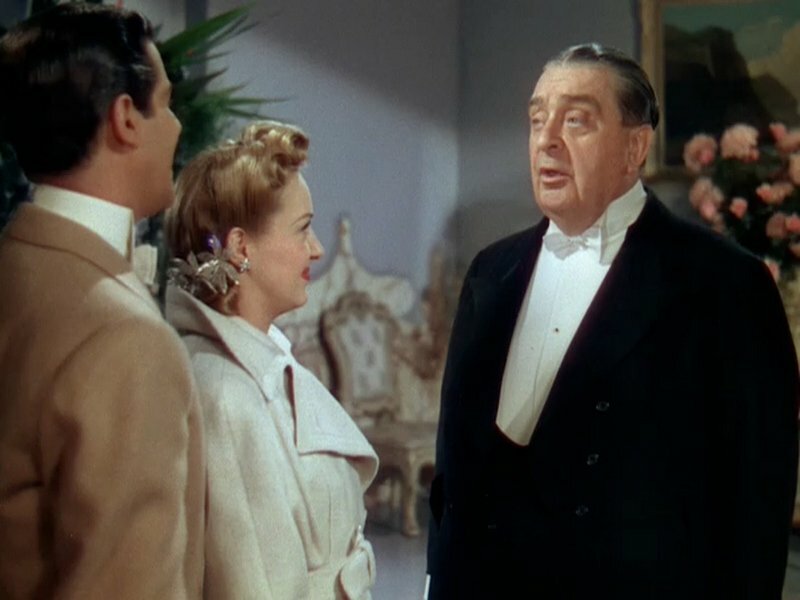 Kay is very persuasive, and soon they quit their jobs and go to Miami, where “rich men are as plentiful as grapefruits.” Cut to a sunny montage! Kay, now arrayed in climate-inappropriate fur, strolls into their luxury hotel with her “secretary” and “maid” in tow. 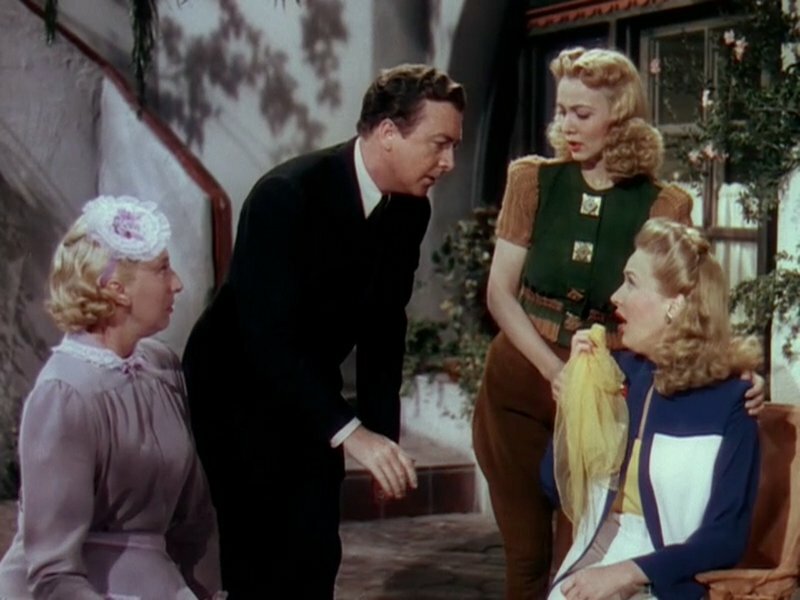 I love that there was never any discussion about which sister would be the “lady” and which would be the “secretary.” Everyone automatically agrees that Kay is the prettiest and their best chance to hook a rich man, even though Carole Landis is no slouch! The obligatory arrival song and dance ends with Sue and Barbara putting pressure on Kay to land a millionaire. They only have a few weeks before the money runs out! The trio are settling into their swell new digs when a butler named Jack (Jack Haley, known to posterity as the Tin Man in The Wizard of Oz (1939)) arrives with champagne. Jeff Boulton, a very wealthy guest, is sending bottles to everyone in the hotel. Kay’s ears perk up. She gets even more excited when Jack brags that he knows everyone in the hotel and can spot a gold digger a mile away. (Though he misses these three.) 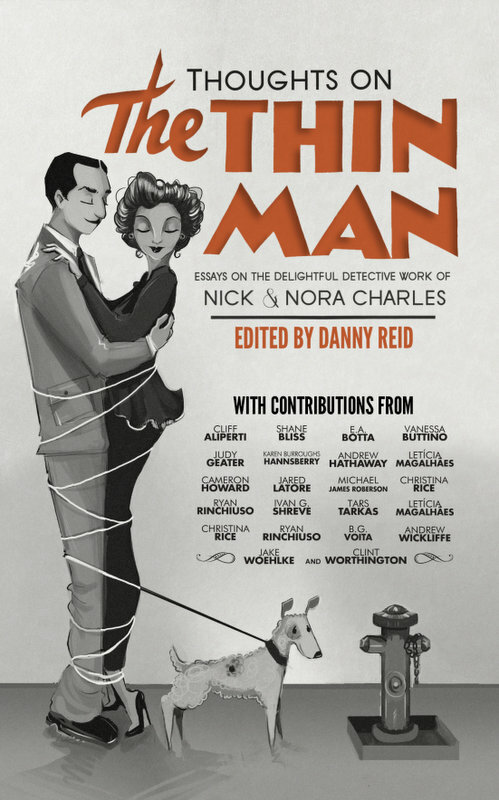 He tells Kay that he will help her find the real rich men by giving her a thumbs up or down whenever she meets someone. Handy! Jeff Boulton gets Jack’s seal of approval, so Kay hatches a plan. 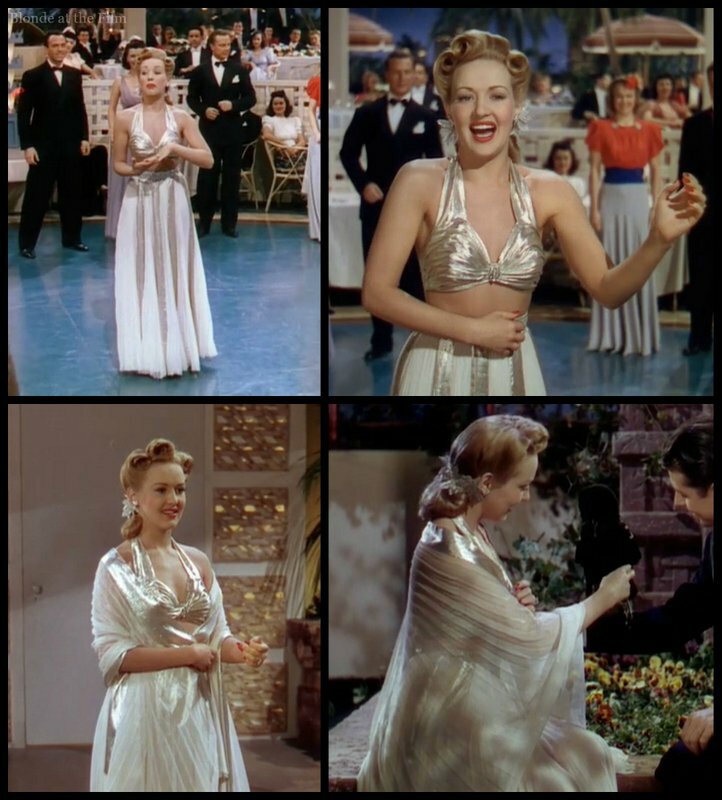 She calls Jeff and tells him that the bottle of champagne he sent was “inferior.” It’s the old “be mean” routine that Kay hopes will make her stick out from all the other girls who fawn and flatter. It works–Jeff rushes over at once! 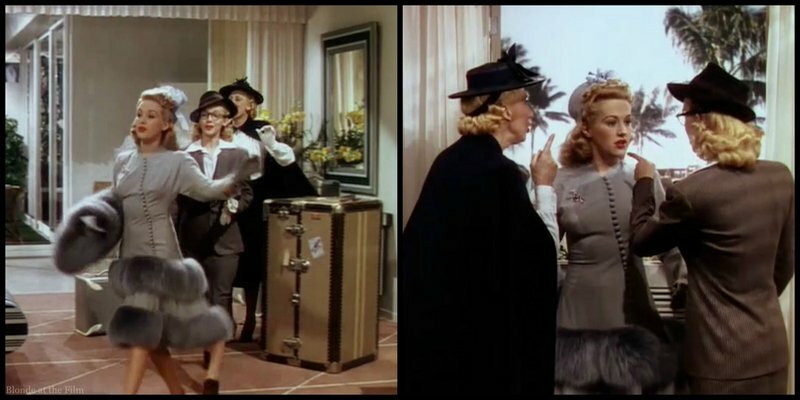 But before he arrives, Kay hands Barbara her thick, fake spectacles, and tells her to put them on because “I don’t want you to look better!” It’s very funny in a cruel way. When Jeff walks in the door, he and Kay both get a happy surprise. She’s gorgeous, obviously, and Jeff (Robert Cummings) is a lot younger (and cuter) than she assumed he would be. Game on! While they begin their romance, Aunt Sue is doing some cooking of her own. She and Jack are rather taken with each other! Kay and Sue have been paired off, but poor Barbara is left to languish as a myopic secretary. But no one really seems to care. 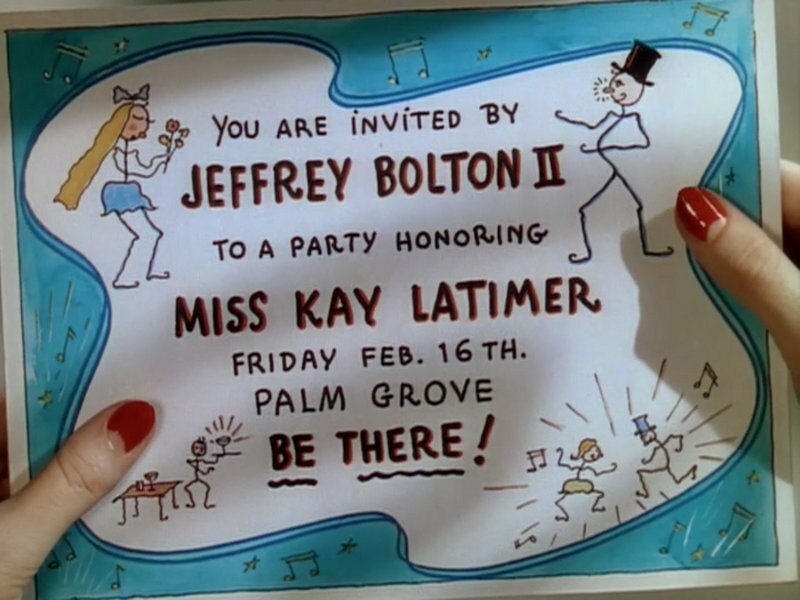 Jeff takes Kay to the party he’s been throwing for three days. 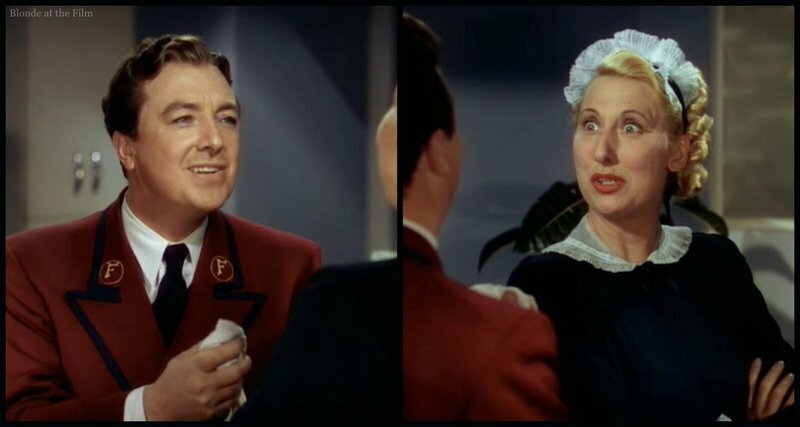 They stumble over the drunken form of Phil McNeil (Don Ameche), whose curmudgeonly rudeness provides a nice contrast to sweet, chivalrous Jeff. But you know immediately that Kay will end up with Phil. 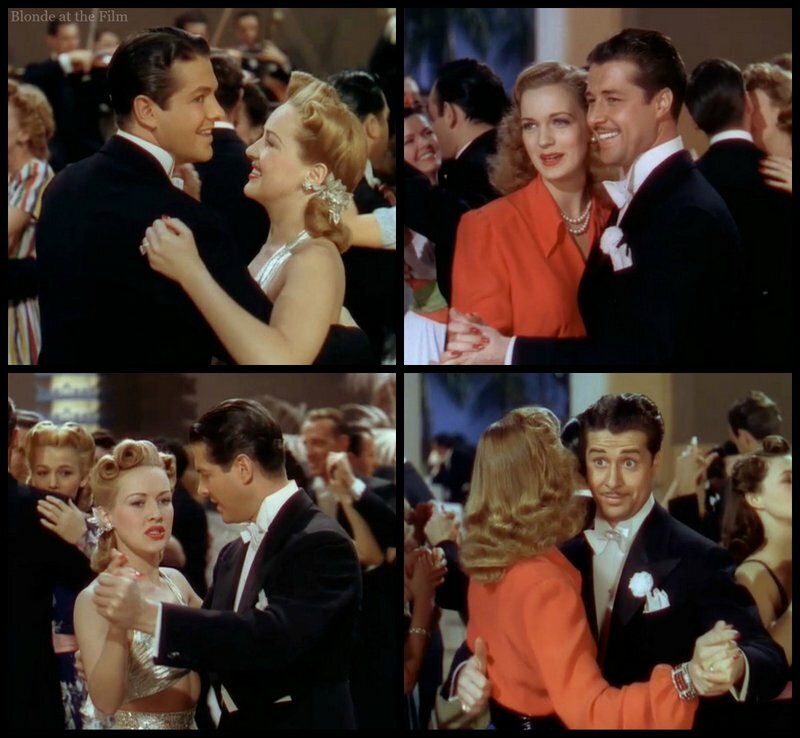 Not least because Grable and Ameche had starred together and found love in Down Argentine Way (1940), but also because immediate dislike is a prerequisite for eventual love. At least in the movies. Remember, these movies aren’t supposed to be realistic! Fun fact: look at how differently Kay’s dress photographs in the lighting in the hotel room vs. the party. It looked navy in the first scenes, but becomes royal blue outside. After Kay’s triumphant performance, this tall drink of water who traveled back through time from the 1980s re-introduces her to Phil. After this exchange, they dance to a wonderful tune called “You Started Something.” (You can listen to Rosemary Clooney perform a slower version here.) Jack, meanwhile, has given Kay the thumbs up about Phil, so she feels pretty good that she’s got two millionaires vying for her. But then it gets tricky. She can’t get time alone with either man because the other one is always popping up. They even chase each other through Cypress Gardens, the same place where Esther Williams would lead a phalanx of water skiers in Easy to Love (1953). There’s a funny moment when Jeff and Kay go flying over a jump and the boat gets swamped when it lands. But the next shot shows the two of them perfectly dry! Movie magic/stunt doubles. It’s all very flattering, but Kay knows that she can never close the deal if she doesn’t get some alone time with her suitors! She needs to hurry, too, because their inheritance is almost gone, and soon the hotel will kick them out! 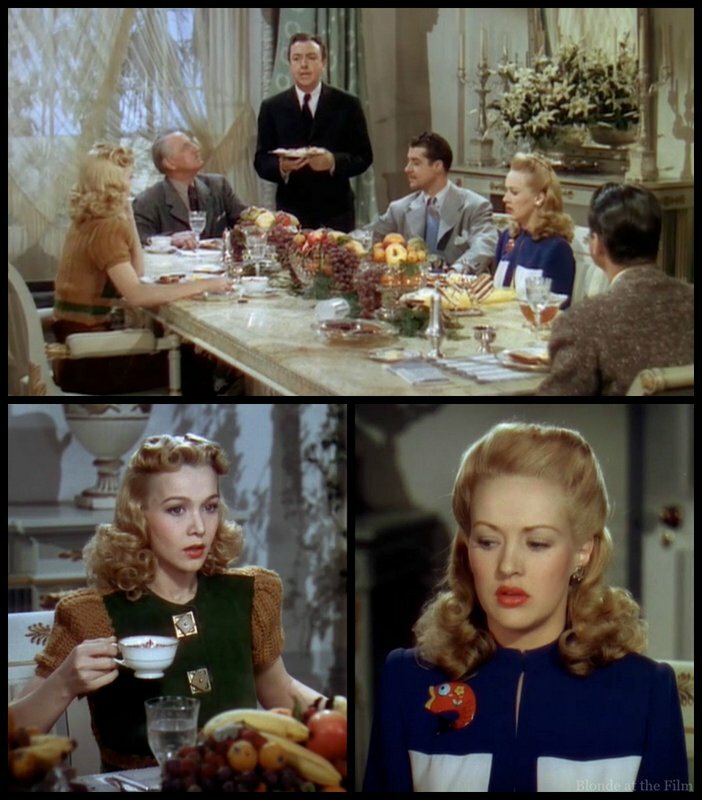 So Kay tells the boys that it is her secretary’s birthday, and as a treat she has invited her to dinner with them. Barbara can occupy Jeff while Kay works on Phil, whom she prefers. Kay removes her sister’s glasses, thus rendering her un-hideous for an evening. Ugly old Barbara wows Jeff when she emerges. So far, so good! Let’s talk about the Technicolor palette for a minute. You’ll notice that a dusky, greyish blue shows up quite frequently. 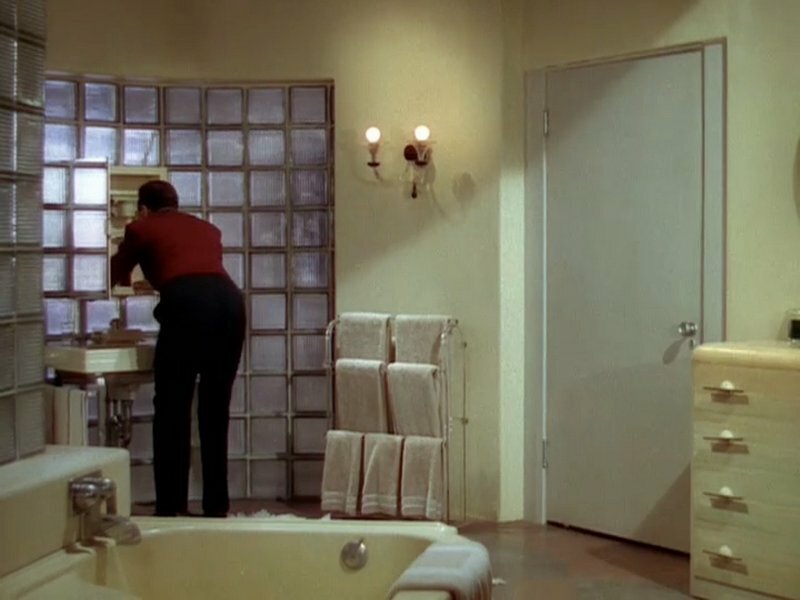 It’s everywhere in this movie: the ladder and trim in the sub (my favorite inexplicable detail), the walls in the hotel, and Kay’s spangly scarf, which you’ll see in a minute. This color, as well as other highly saturated, rich tones, was a mainstay of 1940s Technicolor design. Some colors photographed better than others (you’ll see a lot of chartreuse, hot pink, emerald green, and pale yellow, too), so there is a definite look to films from this era. For more on Technicolor color design, check out this wonderful book by Scott Higgins: Harnessing the Technicolor Rainbow: Color Design in the 1930s . Back to the film! The group enjoys dinner and dancing (a tradition that has sadly fallen out of fashion). Unsurprisingly, Barbara starts falling for Jeff, who rather likes this sympathetic listener. She starts bolstering his self-confidence and encouraging him to get a job instead of loafing around living off of his highly successful father. That’s my move on first dates, too. While Barbara and Kay are out with Jeff and Phil, Sue is cavorting around the suite with Jack. They perform a charming if at times uncomfortable number featuring Greenwood’s famous high kicks. She does the same thing in Dangerous When Wet (1953). It was her shtick. Meanwhile, Phil and Kay have commandeered a boat and are floating along singing and romancing. They profess their undying love and Phil proposes! But then the truth comes out. Phil pursued Kay because he thought that she had a lot of money, and he needs an influx of capital to save his family business. She, of course, was pursuing him for his money, which she now knows doesn’t exist. Awkward. These are two very confused and ill-informed gold diggers. They dissolve their engagement immediately because although they like each other, they are both more interested in money. It’s all very civilized, if cynical. Kay returns home in a tizzy. She is sure that Phil will tell Jeff the truth, Jeff will spurn her, and their grand plan will fail. They will be evicted from the hotel, and forced to return to Texas Tommy’s. But! Phil doesn’t tell Jeff that Kay is a gold digger. Instead, Phil tells Jeff that Kay likes him better. So stupid Jeff runs right over and proposes to Kay, who happily accepts as her heartbroken sister watches from the doorway. Barbara has it rough in this movie. Costume appreciation break. 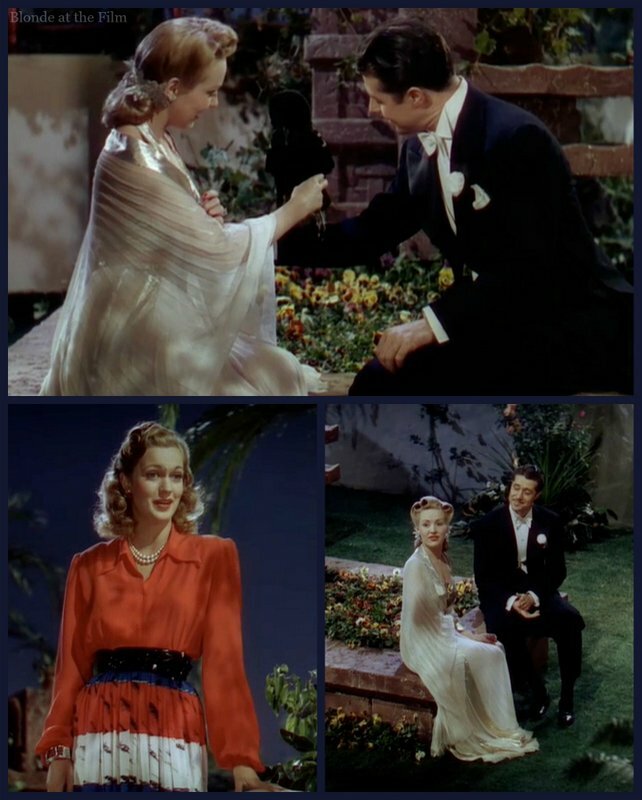 Travis Banton, perhaps best known for his slinky bias-cut gowns in the 1930s, designed the costumes for this film. Fun fact: Carole Landis had recently broken through the ranks of Hollywood starlets with her role in One Million B.C. (1940). Fox was developing her into a star when she made this movie, though she never reached the stratosphere. Landis was very active with the USO and traveled more than 100,000 miles visiting soldiers during WWII, more than any other actress. And like Grable, Landis became a popular pinup, and was even known as “The Chest” because of her curves. Yikes. Back to the film! After the proposal, we cut to a quirky invitation held by a lady with a very trendy reverse French manicure. Nothing is new. And here we go with another cliche: an engagement party where the bride performs a novelty conga! I mean, we’ve all been there, right? 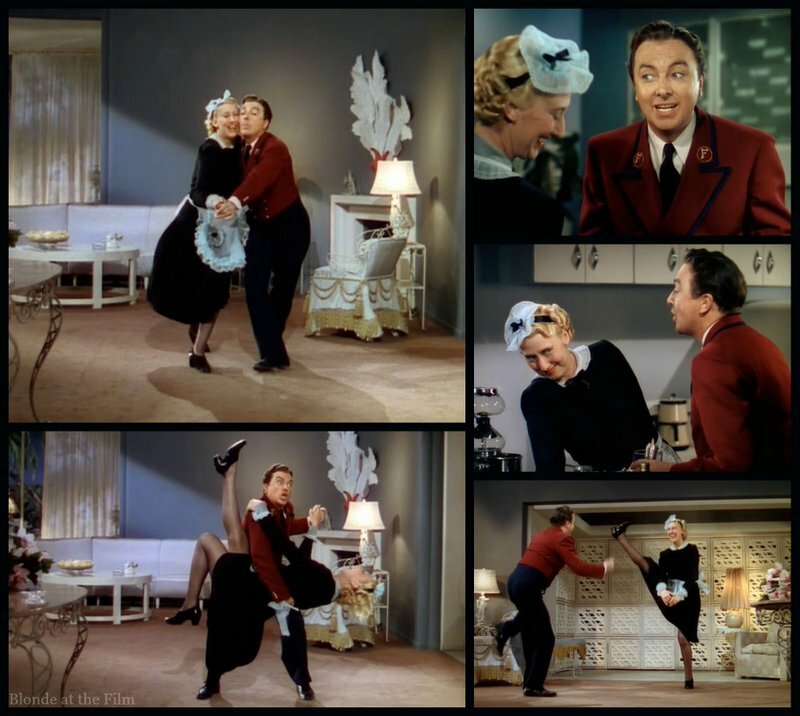 After entertaining the crowd with her “Kindergarten Conga,” Kay performs a spirited routine with a Fred Astaire lookalike. It’s Hermes Pan, fantastic choreographer and dancer who is best known for his collaborations with Astaire. Astaire called Pan his “ideas man,” and the two virtuosos choreographed and rehearsed together for decades. 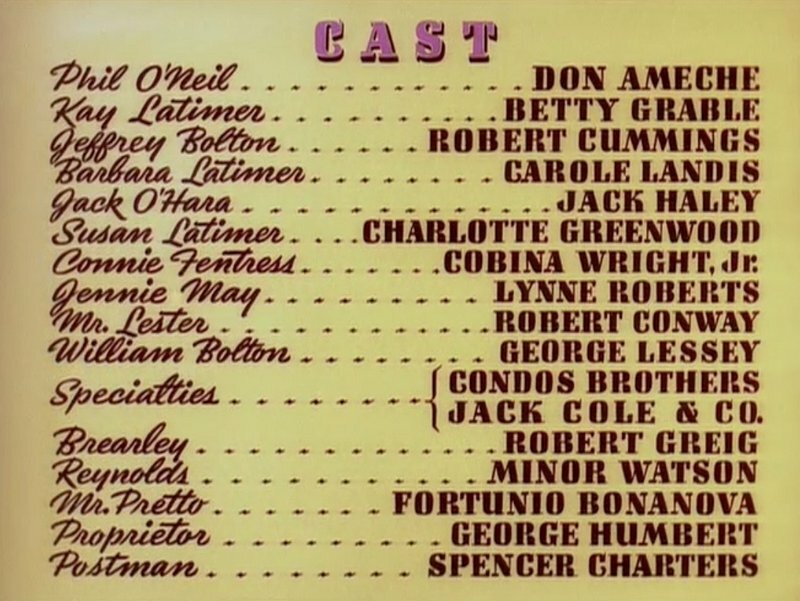 Fun fact: this was the first featured performance of Pan onscreen, though he’d been in a number with Astaire in Second Chorus (1941), and it’s possible that he’d been Astaire’s double for some long shots in earlier films. You can see how it would be difficult to tell if it’s Astaire or Pan at a distance! They even move the same way. After the dance, Kay rejoins her duped fiancé, but her happiness is smudged when she sees Phil romancing Connie, a very wealthy woman. Kay is so upset by Phil that she asks Jeff if they can head to his family home that night instead of the next morning. She wants to keep her eye on the prize, but it’s difficult with that handsome, penniless devil hanging around. As Kay waits for Jeff to grab his things so they can go, Phil shows up to say goodbye. And then another well-known trope pops up: the tame crow conversation in the moonlight(!). Kay and Phil giggle with a crow named Mr. Sylvester (why?) until Connie shows up and ruins their moment. I do not understand why there is a crow in this scene. If they needed a reason to sit in the garden, wouldn’t it make more sense to admire some flowers? There is time for one last, meaningful look…and then Kay runs off. Ameche sure can wear a tux. Costume appreciation break. This gold lamé and pleated white chiffon number is something else! Note the gold strips down the skirt and bordering the shawl. Kay gets back to her suite and finds her sister looking miserable. She asks, “Why aren’t you gay?” and Barbara gloomily replies, “I am gay!” It’s got an extra layer of funny that wasn’t there in 1941. While Kay and Barbara chat in the living room, Jack says goodbye to Sue in the kitchen. She gives him a huge jar of her guaca-mala sauce, which is inexplicably bright red. As they make their fond farewells, Jack hears Kay and Barbara discussing when they should tell Jeff that they’re really broke carhops from Texas. He flips out, and the ladies lock him in the bathroom so they can make their getaway before Jack can tell Jeff. But what a lemony fresh bathroom it is! Kay and the gang arrive at Jeff’s family home and are greeted unexcitedly by the butler, played by the wonderful Robert Greig. No one else can manage such pompous, dry snobbery with such charm. He plays similar roles in Easy Living and Sullivan’s Travels, and I wish he had more screen time in this film. Everything seems to be going according to plan! But then Phil shows up at the house, swiftly followed by Jack. Oh, dear. How cute is Kay’s whimsical fish brooch? The ladies manage to get Jack alone and try to explain the situation. Kay convinces him that she really does love Jeff and wants to make him happy. They make a deal: Jack will watch Kay carefully and if he sees anything that suggests she is only marrying Jeff for his money, he will sound the alarm. Meanwhile, poor Sue has traded in her classic black uniform for a lavender version which doesn’t suit quite so well. Jeff’s father throws a lavish engagement party, but this time Kay doesn’t provide the entertainment. She just dances with Jeff and then Phil, watched all the time by Jack. Kay is furious that Phil has shown up. She loves Phil, of course, so having him around as she marries someone else is cramping her style. After they chat, she runs off to pace in her room. Meanwhile, Barbara has convinced Jeff to get a job in one of his father’s companies. Anyone with half a brain can see that Barbara and Jeff are the ones who should be engaged. While they talk business at a table crowded with coupes (read my History Through Hollywood: Vice for more on alcohol consumption in old films), Phil follows Kay to her room. Naughty boy. At first they fight, but then they kiss. Courtship in microcosm. Jeff bursts in and finds them mid-embrace, but he really doesn’t mind because he just came to tell Kay that he wants to marry Barbara instead! Now isn’t that tidy? 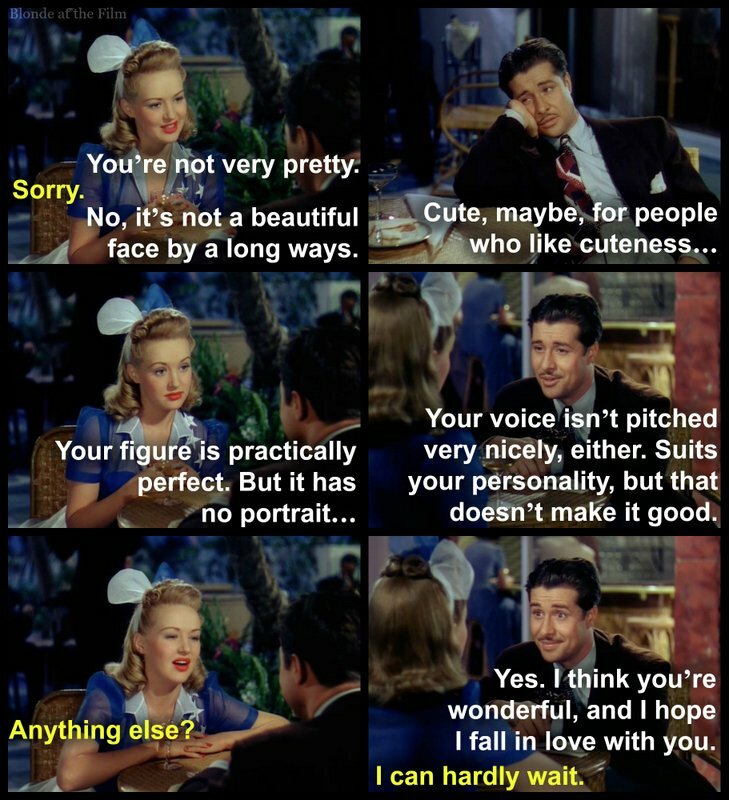 And a nice turnabout for “ugly” Barbara to get the millionaire! More importantly, both sisters marry for love, which redeems their nasty gold-digging characters. Thus, Moon Over Miami follows the trajectory of almost every other movie about women looking for rich husbands. Next thing we know, our gang of six is enjoying the pleasures of Miami. No idea what Phil and Kay will live on, or if Jeff really will start working. But who cares? You don’t watch this film for that stuff. You watch it for the songs, the Technicolor, the stars, and the glorious, joyful artifice. That’s Jack and Sue (really their doubles) water skiing, by the way. It’s happily ever after for all! This movie was in production March through April, 1941, and premiered just two months later on July 4. It was a hit. 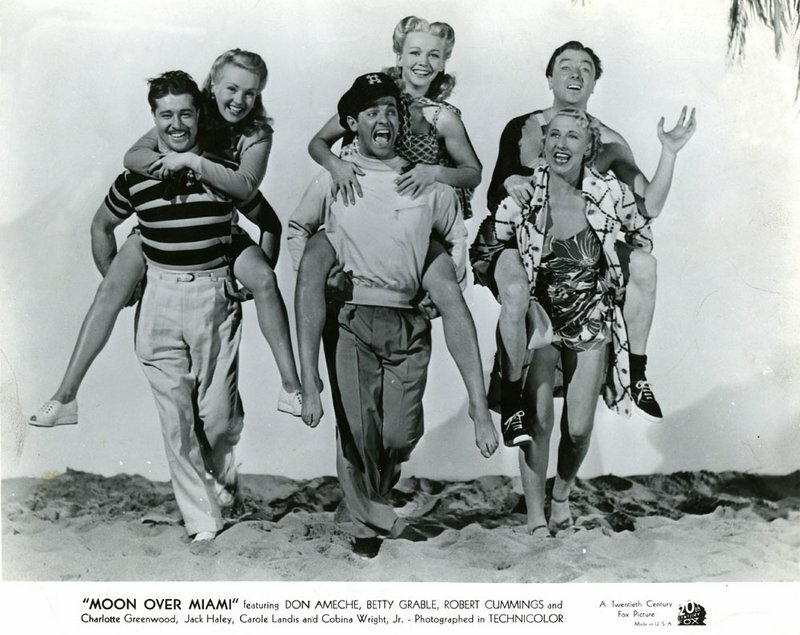 Gaily packaged and pretty as a Fourth of July skyrocket display, “Moon Over Miami,” now at the Roxy, once again shows what Technicolor can do for an otherwise very average musical comedy. For, as sometimes happens, the contents are not as surprising as all the bright ribbons would lead one to expect. The script…is older than memory and nearly as long. 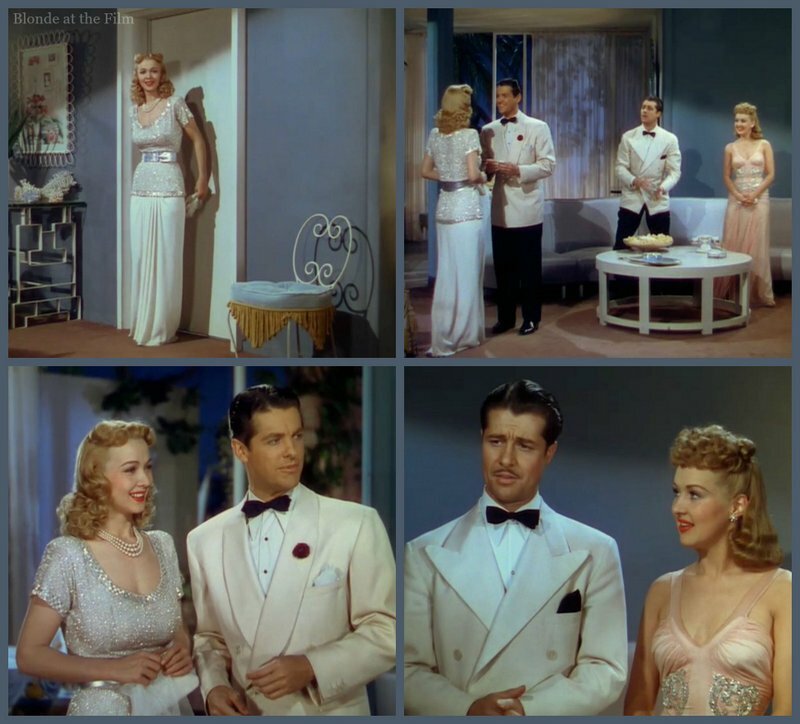 But if you are content—and we were very content—to be dazzled by Betty Grable and Carole Landis in color, to listen to some saucy tunes warbled with a lilt and to beat time in a couple of swirling production numbers, well, one can think of less pleasant ways of spending a hot Summer’s eve. 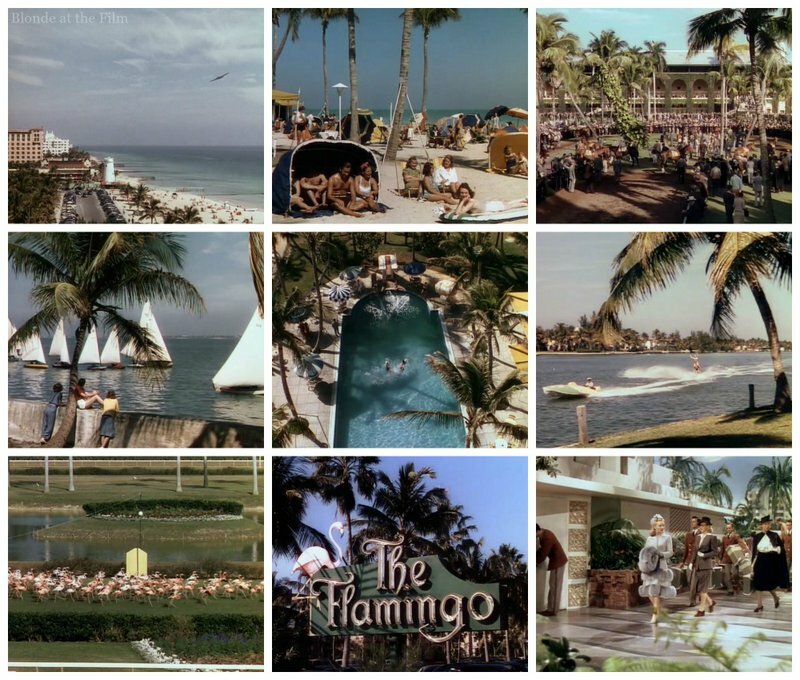 But partly through Walter Lang’s direction, “Moon Over Miami” rarely lets you remember it’s old hat. It keeps dazzling you with little speedboats scooting across blue lagoons, romantic under-water tête-à-têtes…sumptuous parties under the palms and, of course, Miss Grable in a range of pretty and petulant moods. How her moods photograph! I love that line: “how her moods photograph!” The review finishes with “Like its two little heroines, ‘Moon Over Miami’ isn’t very bright in conversation, but it looks wonderful.” Perfect. Moon Over Miami continued Grable’s rise to stardom. Fox kept their blonde dynamo busy, and in 1943 she was voted the number one box office draw by exhibitors, edging past Humphrey Bogart, Greer Garson, and Clark Gable to take the top spot. She remained a popular actress until the 1950s, and retired from the screen in 1956. 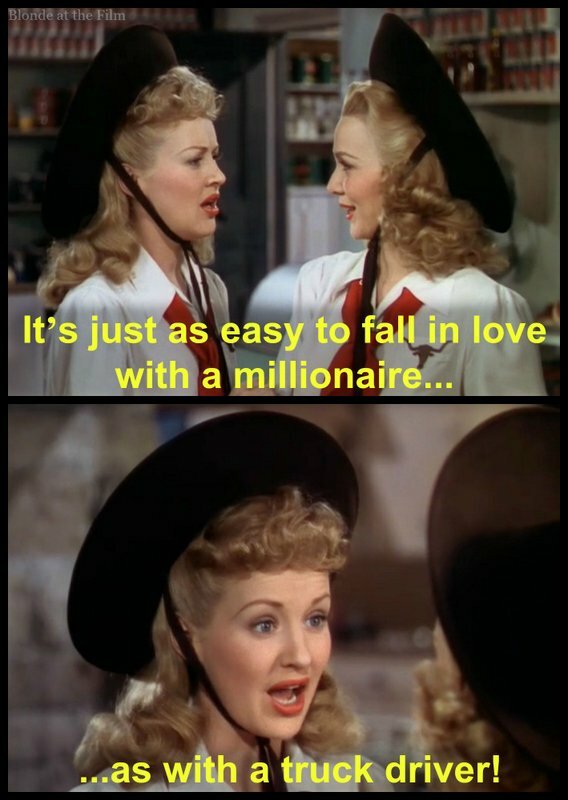 Fun fact: one of her last films was How to Marry a Millionaire (1953), which is basically Moon Over Miami set in New York. Lauren Bacall and Marilyn Monroe round out the trio as three friends who pool their resources to try and catch rich men. 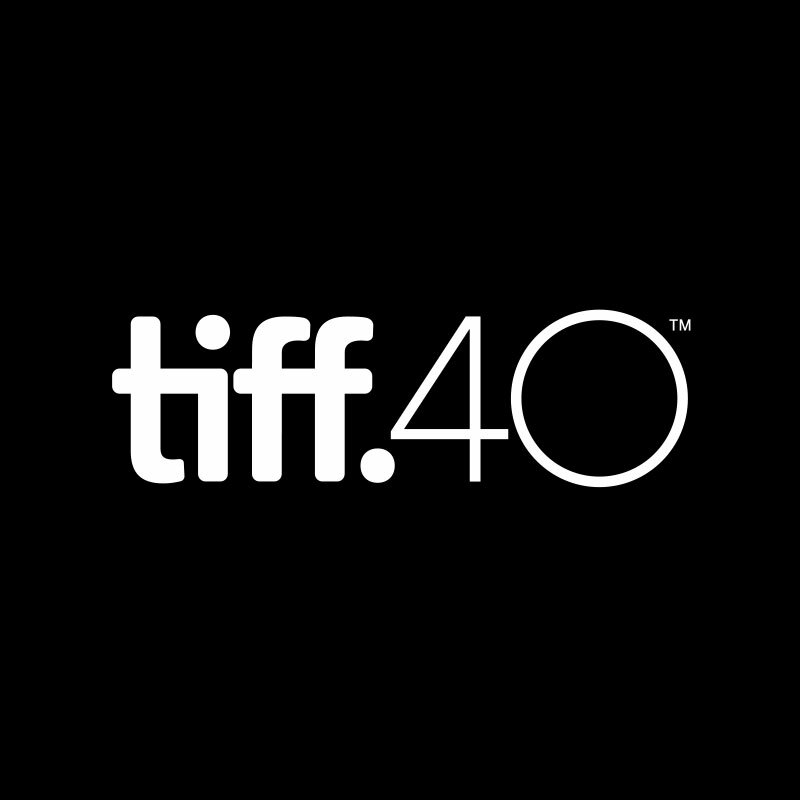 You can watch it on Netflix now! Here’s the trailer of Moon Over Miami, and you can buy this dazzling movie here. For more, follow me on Twitter, tumblr, Instagram, pinterest, and Facebook. As always, thanks for reading! Fun fact: oddly enough, the end credits get Phil’s last name wrong; it’s McNeil, not O’Neil! Love the Fourth of July Dress! I think I’ll borrow it for my next 4th of July BBQ…Always treat! Thanks for posting. Great choice! Thanks for reading! How cool! Thank you for stopping by! I’ll check out your site! Never get tired of watching this wonderful movie. I wish our culture could be like that now. Thank you! So glad you enjoyed this movie and Down Argentine Way! Thanks for reading!